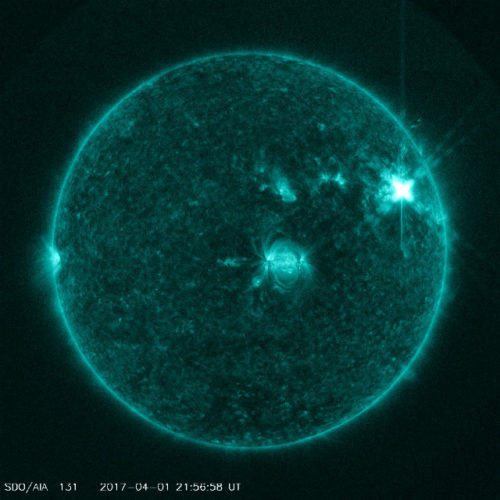 Sunspot AR2644 erupted on April 1st, producing a significant M4-class solar flare. UV radiation from the flare caused a brief shortwave radio blackout on the Pacific side of Earth. People who might have noticed the blackout include ham radio operators and mariners using low-frequency rigs for communication at frequencies below 10 MHz. 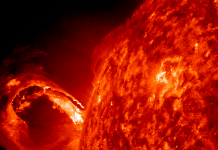 The explosion also hurled a coronal mass ejection (CME) into space. The cloud is not heading directly for Earth, but a glancing blow is possible in the days ahead. NOAA analysts are evaluating this possibility now. 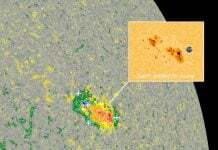 The source of this flare, AR2644, is not the big sunspot discussed below. While forecasters focused their attention on the huge sunspot facing Earth, a lesser sunspot near the sun’s western limb exploded instead. Tricky sun. AR2645 has a ‘beta-gamma’ magnetic field that harbors energy for M-class (moderately strong) solar flares. Any such explosions while the sunspot faces Earth could ionize the top of our planet’s atmosphere and alter the normal propagation of radio transmissions around the globe. Shortwave radio blackouts are possible if the sunspot erupts. 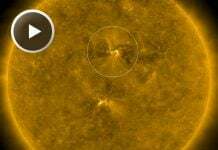 Despite its potential, the giant sunspot facing Earth has so far been quiet, emitting only a crackling of minor C-flares with minimum effect on Earth. 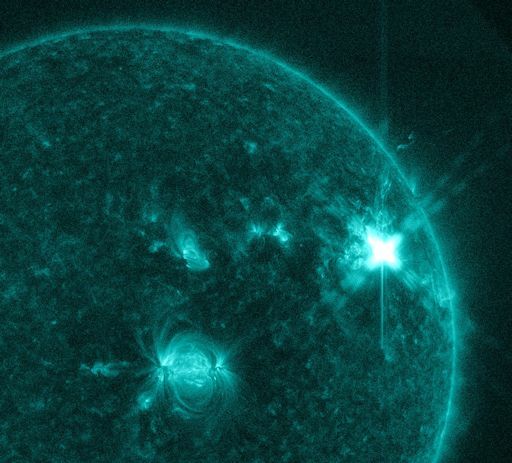 NOAA forecasters estimate a 10% chance of more potent M-flares in the next 24 hours.